Every November, we string a piece of twine along our mantle. Each day we add things for which we are grateful. Things like new sheets, dancing to Stevie Wonder Christmas songs, chips and queso with girlfriends and Lydia’s nightly request for, “one more hug and one more kiss.” I love this simple act because it reminds me of how much I take for granted. For a minute, I have the opportunity to pause and be still. To remember and be grateful. 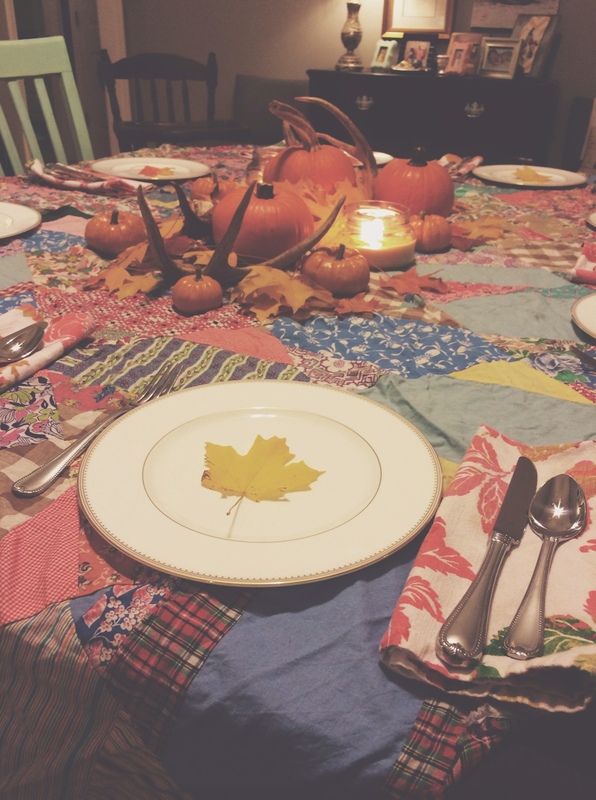 Last Friday, we moved the trunk-turned-coffee-table into our bedroom, set up two long tables in the middle of our living room, took out the fine china and gathered a few dear friends and their families for a Practice Thanksgiving. We all tried out new recipes, my culinary contributions being an adaptation of Nigella Lawson’s Coca-Cola ham and a decadent version of sweet potato casserole that tastes just like the famed side dish at Ruth’s Chris. When we reached that point where you just can’t eat another bite and you’re secretly wishing you had on elastic-waist pajama pants, Liz pulled out her guitar and led a few old hymns for us. I closed my eyes and breathed in the stillness of that moment. Come, thou fount of every blessing. Immanuel. God with us. He came to us. In all the vulnerability of a tiny baby, He came. He didn’t leave us. Even in my disobedience and forgetfulness, my pride and arrogance, my sin and ugliness, He came to me. I remember my pastor teaching a message soon after our first miscarriage where he asked us, “Are you seeking God’s hand or His face?” I was flattened. I was aching with the sting of death, craving life and newness, desperately seeking the creation only His hand could provide. I wrote that little question on a bright pink sticky note and pinned it to the cork board behind my desk at work. I wrestled with that question. I still wrestle with that question. God, I will never be thankful for your Hand until I am thankful for your Face. I will never appreciate your gifts until I am overwhelmed by your Presence. I will never understand Jehovah-Jireh until I am overcome by Immanuel. Thank you, God, for stopping at nothing to be with us.